These stunning dining chairs in natural and rustic oak feature comfortable seat pads, upholstered in our high quality fabric and leather finishes. These dining chairs feature comfortable seat pads, upholstered in our high quality fabric and leather finishes. The chair frames are constructed from solid hardwood with gorgeous rustic or natural oak. The solid hardwood oak chair frame comes in both our natural and rustic oak wax finishes, so you can match your chairs with any of our fantastic dining room pieces, including our tables, sideboards, and more. The genuine leather seat pads come in a range of colours including brown, black, red and cream. And the gorgeous fabric seat pads come in high quality plain and patterned fabrics. Made to perfectly coordinate with our household furniture ranges using traditional carpentry techniques, these oak dining chairs can suit any space. Robust and sturdy, it's no wonder they are such popular pieces for the dining room. 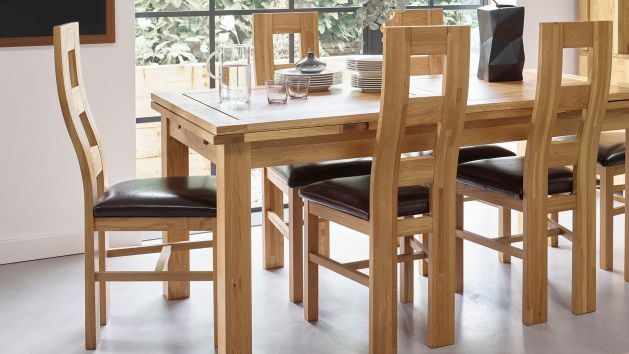 Browse our oak dining chairs today!